For those versed in quantum technology, I don’t mean a bandgap when I say ‘the quantum gap’ – though it would have been an excellent metaphor as this gap is also the difference between isolation and flow. By ‘quantum gap’ I mean the current gap between quantum hardware and quantum software capabilities. These ‘quanta-ware*,’ as we like to call them at Atos, are presently developing at different speeds and almost completely separately from one another, in a series of growth spurts. One of the elements causing the gap between the two aspects of quanta-ware is the ‘technical factor,’ and it’s one I experience frequently. Quantum hardware and software are not yet optimally aligned. On the software side, there is good emulation capacity available, and a quite advanced programming language that I can use to program arbitrary quantum computers. This means that we can make big jumps in a short timeframe on the software side. However, when I want to run the software with the quantum speed-up, I see the hardware isn’t ready yet. And an understanding of how to align quantum software and quantum hardware is still in its infancy – making effectively combining quantum software and hardware a non-trivial challenge. However, hardware capabilities are evolving at an even faster past than software capabilities. In the US, large companies have sizeable, well-funded R&D projects aimed at providing the full quantum hardware stack. In China, money is bountiful and hardware projects are being spurred on via non-western philosophies. Several European initiatives are also being launched, such as the Quantum Flagship which aims at consolidating and expanding European scientific leadership and excellence in Quantum. 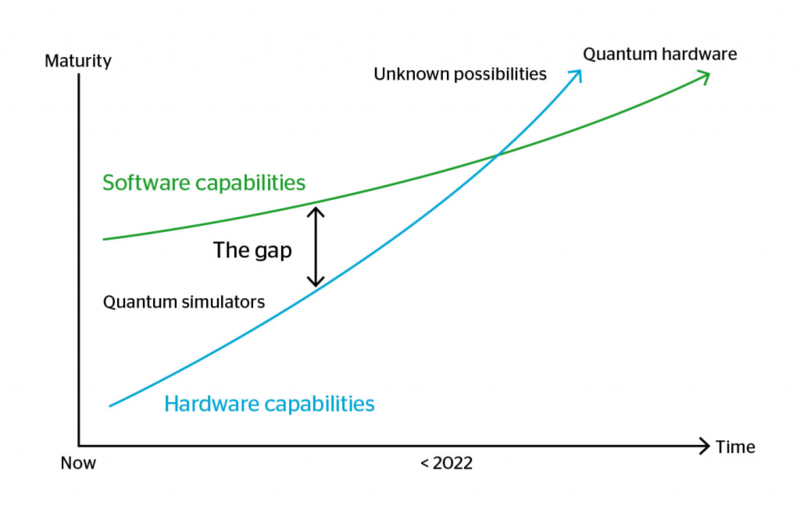 We can expect the current gap between quantum hardware and quantum software capabilities to converge before 2022, enabling practical business use cases. With that in mind, we can expect to see a surge in increasingly beneficial business applications over the coming years. By 2022, we will have a hybrid landscape, where quantum and classical computers interact seamlessly. To understand why ‘hybrid,’ you only have to look at the infamous RSA breaking Shor’s algorithm. Its processes have five steps, only one of which requires quantum computing techniques. And thus, a hybrid platform makes the most efficient use of such an algorithm. Hybrid quanta-ware will initially be integrated into our classical computing legacy as accelerators for different, yet specific, workloads. The size of the integration challenge should not be underestimated. While they will be partially resolved by smart, hybrid (cloud-based) platforms, to succeed we should take care to avoid the limitations of thinking about computing in traditional ways. Quantum is a very interesting field to work in. If you can bridge the gap, you put yourself in a very desirable position, for the simple reason that there is a lot of valuable know-how in this. In the short term, we expect quanta-ware to provide breakthroughs in areas such as artificial intelligence and machine learning. World-leading companies in aerospace, finance, IT and automotive are already investing in solutions around these kinds of use cases. In the longer term, quanta-ware will change how we approach IT security: on the one hand causing new threats while conversely suppling unbreakable security models. It will also eventually create solutions in Big Data and complex analytics. On the other hand – the cyber/geopolitical hand – quantum computers, of critical size, are very interesting means of cyberwar. And, we do not know whether other countries have already realized that to utilize this power, they also need to bridge the gap. Whatever the future might bring, we’ll see the major changes occur in our journey to 2022. When and how this gap can be bridged can be read in our new Journey 2022 researched and written by Atos Scientific Community. 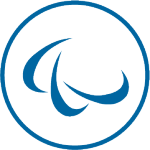 *Quanta-ware is an Atos defined term to encompass quantum computing hardware and software solutions.